Protestors hold signs opposing Vail Resorts' application for a trademark of "Park City" outside City Hall Wednesday afternoon. PARK CITY, Utah — Vail Resorts, with Park City Mountain Resort, said Saturday it would withdraw its polarizing trademark application for the name “Park City” as it applies to a ski area, an unexpected turnabout amid widespread opposition to the bid to trademark the name of the community. Park City Mountain Resort on Saturday morning released a prepared statement attributed to Bill Rock, the chief operating officer of the resort, explaining the decision to withdraw the application, which was filed with the U.S. Patent and Trademark Office. He noted the application was initially filed by Powdr Corp., the former owner of Park City Mountain Resort, and it is “common within the ski industry” to obtain trademarks. 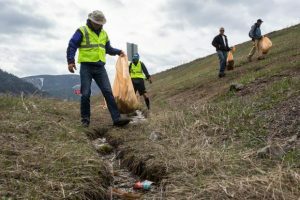 He also mentioned the opposition in the community, which reached a crescendo in the last week as critics mounted a well-attended rally outside the Marsac Building as City Hall officials and Vail Resorts executives huddled to discuss the matter. There were dozens of individuals or businesses considering formal oppositions with the Patent and Trademark Office. City Hall was one of the entities weighing whether to mount a formal opposition. “In 2014, while under Powdr Corp ownership, an application was filed with the Patent and Trademark Office to register the word mark ‘Park City’ for providing facilities for skiing and snowboarding. After our acquisition, we supported that application because we think it’s appropriate to obtain the benefits of federal registration for the Park City mark, which has a long history of use in connection with the ski resort that is located in the Park City community. This is common within the ski industry and there are other businesses in our community that have registered Park City for their products. “However, recently there has been much concern raised in the community about what the impact of our trademark registration would be. We have tried to assure the community that this registration would not negatively impact other businesses and we do believe that there has been some misunderstandings and misinformation about the trademark registration. “That said, this has clearly become a distraction that is pulling our collective focus away from the important work that lies ahead for our city on critical issues, such as affordable housing, parking and transit among others. As such, we have decided to withdraw our trademark application in an effort to move beyond this concern. In addition, we will be updating certain of our wayfinding and vehicular signage in Park City to address any local confusion about the difference between the resort and the municipality.